. : Optics & Photonics Focus :: A Wind Tunnel for Quantum Physics :. Inside the quantum wind tunnel. 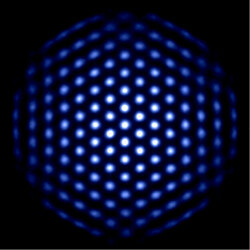 The individual ions (dots) behave like tiny magnet bars (spins) which can orient themselves according to their neighbors and reproduce very complex quantum phenomena. In the early days of aeronautics, computers that could simulate the subtle laws of aerodynamics did not exist. For this reason, people built wind tunnels to study the physics of flight on model systems. Quantum physicists are now facing a similar situation where they cannot satisfactorily simulate the behavior of many interesting quantum systems on even the most powerful computers. Scientists have, therefore, been looking for ways to build some physical systems that may be used as quantum simulators, the quantum analog of wind tunnels. This has so far been possible only for relatively simple quantum systems, involving only a few dozens of interacting quantum particles. However, many interesting effects are believed to happen in the presence of a larger number of interacting particles. Joe Britton, at the National Institute of Standards and Technology (NIST) in Boulder, Colorado, USA, and coworkers have now demonstrated rudimentary operation of a quantum simulator with hundreds of simultaneously interacting quantum particles. The NIST machine may well be a stepping-stone on our way towards a rational design of quantum materials. Why simulate? After all, the laws of aerodynamics and quantum physics can be described using mathematical laws. Interestingly, however, these laws lead to very subtle and complex phenomena. On the one hand, air flowing around the wing of an aircraft, for example, frequently leads to rather strong turbulence. On the other hand, interacting quantum particles can depend on each other without exchanging any signals. Both situations can be described mathematically. At the same time, however, they are excruciatingly difficult to reproduce with computer simulations. The turbulent flow of air is a chaotic phenomenon for which tiny inaccuracies of the computer simulation can potentially lead to totally wrong predictions. Interacting quantum particles have many degrees of freedom, and this easily brings even today’s largest supercomputers to their knees. Wind tunnels and quantum simulators are used to reproduce a phenomenon directly in a controlled environment. Instead of mathematically describing the air particles, they use real air streams; instead of writing mathematical models of quantum particles, they use quantum systems such as ions to actually produce an interesting effect. And the wind tunnel or simulator allows the experimenters to easily modify experimental conditions such as wind speeds or interaction strengths. What questions can be answered using these tools? The history of aviation may give us some hints: in the early 1900s even the slightest glitch in the design of an airplane or parachute would often mean the certain death of the pilot. Yet, in order to advance the times’ understanding of aerodynamics, it was essential to identify what aspects of avian flight were generating the lift: was it the movement of their wings? The shape of their wings? Or their material? And how could artificial wings that generated enough lift to make humans fly be built? To answer these questions, the Wright brothers and many of their peers studied smaller scale models in very basic wind tunnels. After all, these experiments were far less deadly than jumping off cliffs. And after countless attempts and fails, people had enough knowledge and ingenuity to build the first airplanes. Today’s quantum science and engineering are not dissimilar to the science and engineering of early aviation: how can we sustain specific quantum phenomena? How can we suppress unwanted interference and interaction between our quantum system and the uncontrolled environment? The main reason for the complexity of quantum physics is quantum superposition and entanglement  – arguably the most striking difference between classical and quantum physics. A classical binary digit (bit) can represent either the number 0 or the number 1. Therefore, to describe N bits, only N numbers are required. This binary language is the foundation of all of our present day, classical computers. We may think of a classical bit as a coin that is either heads or tails. A quantum bit (qubit) is the quantum analog of a classical bit and can represent any combination of the numbers 0 and 1. And how are the qubits implemented in the present experiment? "The outermost electron of each ion," Britton explains, "acts as a tiny quantum magnet, known as spin, and is utilized as a qubit. Quantum mechanics permits this spin to be in a superposition of states, for example simultaneously oriented parallel to, and antiparallel to, a laboratory magnetic field." Moreover, physically well-separated particles may be tightly interconnected, that is entangled. For example, two qubits can be in a state where both are always measured either in their 0 state or in their 1 state. If we were to add a third particle, its 0 and 1 states could each depend on any combination of the other two particles. This fact leads to an exponential growth in the number of variables: to represent N qubits, approximately 2N numbers are required. This leads to insurmountable problems when trying to simulate quantum systems on today’s classical computers: the amount of memory and the number of computations required are simply too much to handle even for our most powerful supercomputers. A different approach is therefore needed to study large interacting quantum systems. And this is where quantum simulators come in. By offering the ability to recreate interesting quantum effects in a controlled model setup, quantum simulators are expected to boost our understanding and advance engineering. Instead of air flow, quantum simulations often consider quantum bits, called spins. Here, we can think of a spin as a tiny magnet bar that can orient itself arbitrarily in three dimensions: "Previous experiments," Britton explains, "have used only about a dozen interacting spins. The NIST simulator, in contrast, permits controlled interaction of as many as 450 spins." One field where quantum simulators can provide insight is the study of quantum phase transitions. Transitions between classical phases — gas, liquid, solid — are driven by thermal fluctuations. Quantum phase transitions, in contrast, are a consequence of quantum fluctuations that are present even at zero temperature. And, as we have seen above, this is the worst combination when it comes to computer simulations. For a quantum simulator, on the other hand, entanglement would simply be a feature of the setup, not a problem that needs to be addressed with tremendous amounts of RAM. NIST’s quantum simulator would be suitable for simulating quantum magnetism, interacting spins arranged on the nodes of a flat grid — scientifically known as quantum Ising interactions on a two-dimensional lattice. "The Ising model," he continues, "describes a simple pair-wise interaction between pairs of spins on a lattice. Among its applications is explaining how weak short-range interactions can give rise to long-range ordering and bulk magnetization. Yet another application is the calculation of phase transitions in magnetic materials (e.g. from paramagnetic to ferromagnetic)." "Britton’s simulator finally gets us closer to having a usable quantum simulator," says Tobias Schätz  from the Max Planck Institute of Quantum Optics in Garching, Germany. "Different groups have studied a variety of possibilities to building quantum simulators, and it now seems that trapped ions have allowed us to really get to the next level: that of developing quantum simulators that can simulate systems too complex for even our most powerful computers. Of course, we still have to study these new experiments very well to see how far we can trust their results, but I am very excited about Britton’s results." "Our technological world," Britton concludes, "depends greatly on ‘simple’ quantum devices like the Global Positioning System (GPS) and lasers. What’s needed is simulation support to guide the development of quantum materials such as, for example, high temperature superconductors." A. Friedenauer, H. Schmitz, J. T. Glueckert, D. Porras & T. Schätz, Simulating a quantum magnet with trapped ions, Nat. Phys. 4, 757-761 (2008). AN is a Research Associate with the Department of Applied Physics at Stanford University, California, USA. His research focuses on quantum circuits, modeling of nano-photonic devices, and numerical optimization. Joseph W. Britton, Brian C. Sawyer, Adam C. Keith, C.-C. Joseph Wang, James K. Freericks, Hermann Uys, Michael J. Biercuk & John J. Bollinger, Engineered two-dimensional Ising interactions in a trapped-ion quantum simulator with hundreds of spins, Nature (2012) 484, 489-492 (link).